BEIJING • When footballer Alex Teixeira gave up on his dream move to 18-time English top-flight champions Liverpool by signing for Jiangsu Suning last week, it was clear that the times are changing. The Chinese Super League club met Shakhtar Donetsk's demands of €50 million (S$78.4 million) for the attacking midfielder, while Liverpool had an earlier bid of £24 million (S$48.6 million) rejected. For all the talk about the Premier League's record TV deal leading to bigger - and even inflated - transactions, Teixeira's transfer fee would have shattered the club record of 16 of the 20 top-flight teams in England, including Liverpool. And Teixeira, 26, was not Jiangsu's only high-profile signing. The Nanjing-based club, who finished ninth in the 16-team CSL last season, also splurged £25 million on Chelsea midfielder Ramires, securing two of the three biggest deals worldwide during the latest transfer window. The clout to attract sought-after players in their prime is not limited to just one Chinese club. 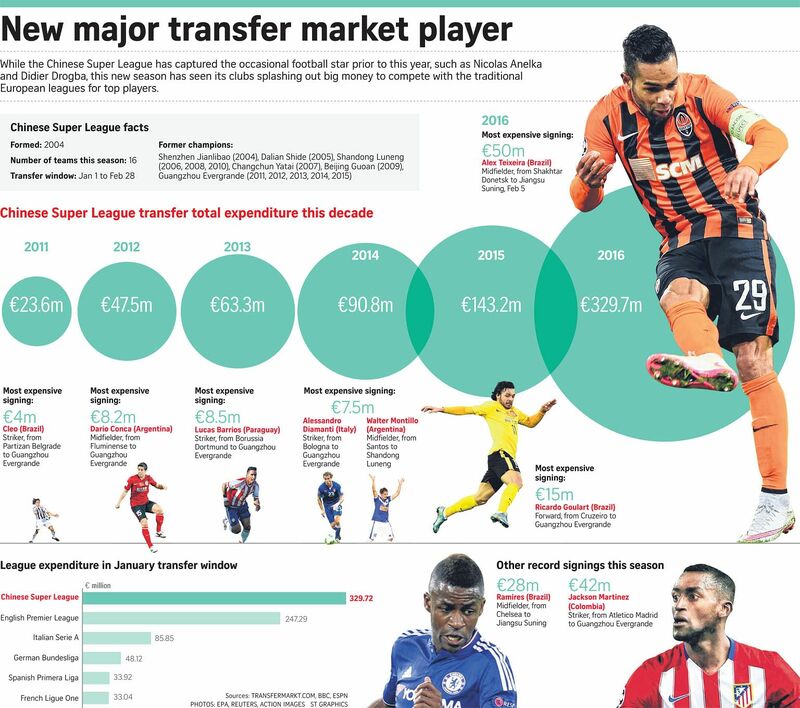 Guangzhou Evergrande Taobao were responsible for the second- biggest deal - the €42 million capture of Atletico Madrid striker Jackson Martinez, 29. Hebei China Fortune made Roma forward Gervinho, 28, their marquee signing for €18 million, while Shanghai Greenland Shenhua strengthened their squad with Inter Milan midfielder Fredy Guarin, 29, for €13 million. Shanghai SIPG, last season's CSL runners-up, already had Ghana striker Asamoah Gyan in their ranks but raided champions Guangzhou for top-scorer Elkeson, and are chasing former Manchester United hit-man Robin van Persie. "You can't take away the fact that money is the primary factor," Shanghai SIPG manager Sven-Goran Eriksson said of the league's magnetism. The Chinese clubs are flush with cash and his side are backed by Shanghai International Port Group, which owns China's biggest port. Guangzhou are bankrolled by property developer Evergrande and Alibaba, one of the world's biggest e-commerce sites. Jiangsu are owned by one of the largest privately owned retailers in China, while Hebei are owned by an industrial park development company that is reportedly worth £8.75 billion. The usual investors are the real estate giants, but increasingly you're seeing big retail and e-commerce companies coming in, like Suning and Alibaba. ZHU XIAOLONG, a Guangzhou-based journalist, on a wider range of Chinese companies investing in football clubs. It helps that the spending has been encouraged by a government headed by big football fan Xi Jinping. The President is tired of the world's most populous country continually failing at the world's most popular game. He wants China to host - and win - the World Cup. Before Qatar won the 2022 World Cup bid, stars such as Gabriel Batistuta, Pep Guardiola and Frank de Boer boosted the profile of the country's league. Now, China represents one of the hottest football destinations. Wealthy businessmen are getting involved, in part, to curry favour and craft links with the politicians and, even perhaps, to make money. Guangzhou may have spent more than US$150 million (S$209 million) on players and coaches since 2010. But Evergrande, which bought the club for US$16 million, sold 50 per cent of it for US$190 million to Internet giant Alibaba - just four years later. "Whether you are (Alibaba's billionaire founder) Jack Ma or (Evergrande's billionaire chairman) Xu Jiayin, no matter how rich you are, you still have to play the game within the system," historian Xu Guoqi from the University of Hong Kong told The Straits Times. "So political capital is one reason for their involvement. Furthermore it makes sense from an investment perspective. The companies make money, and it's also a good public relations exercise for the companies, because the Chinese are very interested in football." And their appetite is growing. Last year, Chinese broadcasters paid just US$9 million to show local league games. This year, that figure will rise to more than US$200 million as part of a US$1.25 billion package over the next five seasons. "Football is China's biggest sport. Backing a club is a form of advertising for the parent companies and helps with brand recognition," Guangzhou-based football journalist Zhu Xiaolong told The Straits Times. "For example, Evergrande's name become known throughout the country, and beyond the property circle, because of its association with the club. "The usual investors are the real estate giants, but increasingly you're seeing big retail and e-commerce companies coming in, like Suning and Alibaba." According to Zhu, clubs are willing to splash out on high-profile signings because this business model has worked well for Guangzhou. Over the years, the club have signed the likes of Argentinian midfielder Dario Conca and Brazil stars Robinho and Paulinho and enjoyed success on the pitch. Guangzhou are now five-time CSL champions and two-time AFC (Asian Football Confederation) Champions League winners. They have also recorded two fourth-place finishes at the Fifa Club World Cup. "This made the other clubs take notice," Zhu said. "We started seeing more investment - they realised that one way to get good results is basically to replicate Guangzhou's blueprint." The 2016 CSL season, set to kick off next month, is the most eagerly-awaited yet. Last year saw an average attendance of 22,000, less than 200 behind Italy and France. A high-ranking league official said that this season will see the 25,000 barrier broken and predicts that by 2018 the CSL will be the third most-watched football league in terms of average attendance in the world behind the Bundesliga and the Premier League. What is certain is that there is money, the political will, the infrastructure, the passion, the ambition and plenty of potential.